The Staller Center for the Arts has received a $450,000 ten-year gift commitment from Campolo, Middleton & McCormick, LLP. Stony Brook, NY - January 24, 2019 - The Staller Center for the Arts has received a generous ten-year gift commitment in the amount of $450,000 from Campolo, Middleton & McCormick, LLP, a premier full-service business law firm with offices in Ronkonkoma, Bridgehampton, and soon a new location in Westbury, Nassau County. This gift was made because of the leadership and generosity of CMM Managing Partner Joe Campolo, a Stony Brook University alumnus, Alumni Association Past President, and valued member of the Staller Center Advisory Board. This new pledge solidifies the firm’s dedication to the arts and the University as a whole. The firm’s gift will continue their support as an annual Major Corporate Supporter of the Staller Center for the Arts Live Season and Stony Brook Film Festival. It fundsa new modern sound system for both the main stage theater and recital hall to enhance live performances at the Staller Center, funds the Alumni Association Past President’s Scholarship, and the Joseph N. Campolo Award for Legal Studies. The firm’s support of the Staller Center under the leadership of Joe Campolo is in addition to the firm’s longtime significant support of Stony Brook Athletics, spearheaded by CMM Senior Partner Scott Middleton, for whom the Middleton Family Student Athletic Alumni Award is named. Philanthropy is a critical component of CMM’s DNA. In 2018,the firm launched CMM Cares, a volunteer initiative to benefit the community with donations of time, dollars, and support. As aLong Island business leader, Chairman of the HIA-LI Board of Directors, and Staller Advisory Board member, Joe Campolo also serves on the Board of Directors of the Long Island High Technology Incubator, also based at the University. Scott Middleton is a member of the SBU Intercollegiate Athletic Board and Stony Brook Children’s Hospital Task Force among many other prominent board associations. Outside of NYS allocated funding, nearly 70% of support for Staller Center for the Arts comes directly from private donations through the generosity of corporations, individuals, and foundations. Funds raised directly impact the caliber of performers the Staller Center brings in, keep ticket prices affordable, and benefit critical arts and education outreach to the Long Island community. 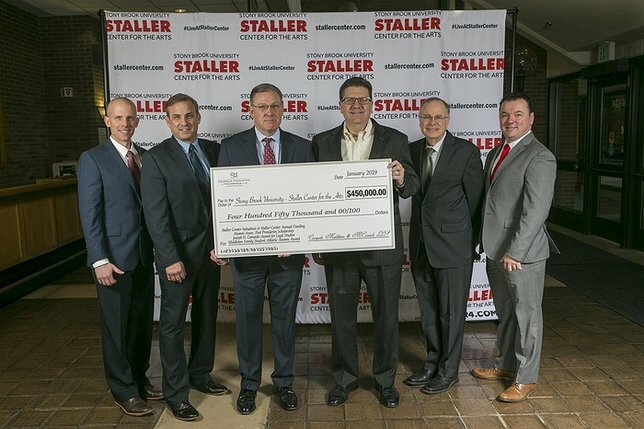 The new sound system that CMM funded for the Staller Center was a much-needed upgrade to both theaters and creates a new sleek look and dynamic sound performance. The Staller Center for the Arts is extremely thankful to Joe Campolo and his CMM colleagues for their unwavering dedication to helping keep the arts thriving. Staller Center for the Arts is a cultural hub on the campus of Stony Brook University. Along with a full season of live world-class performances, Staller Center presents the Metropolitan Opera in HD, Staller Center’s Community Education and Outreach efforts provide youth and students the opportunity to incorporate cultural arts into their lives, Staller Center Friday night movie series, and the host of many Department of Music events. The Stony Brook Film Festival presented by Island Federal Credit Union is a showcase for new independent film from around the world every summer. Staller Center box office hours are Monday to Saturday, 12:00noon to 6:00 pm. Phone: (631) 632-ARTS  or visit stallercenter.com. Subject: LongIsland.com - Your Name sent you Article details of "Campolo, Middleton & McCormick, LLP Commits $450,000 to Support Cultural Arts and Scholarships at Stony Brook University"